Fifty seven local breweries – from fan favorites, to local legends and newly opened sud houses -- will pour alongside selected special guest out-of-state breweries. Once inside the park, attendees can drink-in all that the Massachusetts craft beer scene has to offer. Tickets are $45 for general admission and includes unlimited two-ounce beer samples from participating breweries. Non-drinkers who wish to enjoy the atmosphere and an afternoon with friends can purchase a Designated Driver Ticket for $10. Once inside the festival, patrons can purchase gourmet eats served up by food trucks onsite. The Mass Fermentational is a 21+ event, no exceptions. Identification required at the door. No dogs allowed with the exception of certified service animals. For more information about the Mass Brewers Guild, or the Mass Fermentational, visit MassBrewersGuild.org or download the state’s FREE beer trail mobile application “Mass Craft Beer,” available in iTunes and Google Play stores. To purchase tickets, visit massferm.eventbrite.com. Down the Road Brewing Co.
For questions or more information about this event, contact Katie Stinchon at katie@massbrewersguild.org. To purchase tickets, visit https://mbgcon2018.eventbrite.com. In today’s ever-changing media cycle, and with 154 breweries in Massachusetts, it’s tough to insert your brewery news into the news. Hear from local journalists, Dan Adams from the Boston Globe, Jackie Cain from Boston Magazine, Norman Miller, the Beer Nut from Wicked Local Publications and Andrea Shea from WBUR, on what they like to cover and the best way to make headlines. Moderator: Katie Stinchon, executive director of the Mass Brewers Guild. Learn from quality control experts; Zach Boda from Allagash, Jaime Schier from Harpoon Brewery, Kate Steblenko from Jack's Abby, and Merritt Waldron from Rising Tide, on various fermentation-related topics and how to troubleshoot fermentation issues related to yeast-handling practices. Moderator: Chris Sellers from The People’s Pint. Engaging with craft beer fans on social media can be one of the most effective ways to humanize your business, get to know your audience, drive event attendance and create brand loyalty – but how do you cut through the noise and create thumb stopping content? Learn best practices from Rachel Poor, president of Thread Communications, Digital Strategist and Marketing Consultant, coupled with beer photography workshop offered by Kelsey Roth from Exhibit ‘A’ Brewing. Technical: "Break out the #BASustySledge and Break Down Your Barriers to Brewery Sustainability"
In this panel discussion, three industry experts will share their “Top Ten List,” of questions brewery owners should be asking to protect their business, employees, intellectual property and overall lower risk. John Moran, lawyer from Bernstein Shur, James Sanborn, an insurance agent from GHM and Bob Young, a partner at Bowditch & Dewey, will answer all your questions without the meter running. Moderator, Rob Burns, MBG President and co-founder of Night Shift Brewing. Hop farmers, suppliers, and brewers will come together to talk about industry trends, negotiating contracts, and how to best work with our supply chain partners. Industry pros, Liz L’Etoile, co-owner of Four Star Farms, Ryan Houghton president of The Hop Yard, Judy Nadeau, sales manager at BSG, and Matthew Steinberg, co-founder of Exhibit ‘A’ Brewing Co., will take part in this discussion and take questions from attendees. Moderator, Jeremy Cross, Battle Road Beer Co. Whether your brewery is in start-up mode or is well established and producing award-winning ales, pilsners or lagers, chances are at some point your business will need financing to purchase equipment or hire staff. Kelly Arvidson, VP, Business and Economic Development at MassDevelopment, Erik Adams Sr. Vice President, Director of Marketing and Lending at Bay Colony Development, and Keith Sullivan, co-founder of Medusa Brewing Co., will talk about the different ways that breweries can acquire the funds they need to grow. Moderator, Sam Hendler, MBG Treasurer and co-founder of Jack's Abby Craft Lagers. When these powers combine, it’s sure to be a good time. Calling all Massachusetts tap rooms, breweries, brew pubs, bottle shops, and restaurants! The Mass Brewers Guild and the team at BeerAdvocate are joining together to encourage everyone in the Massachusetts beer industry to celebrate and support the fine beers brewed in our great Commonwealth by hosting craft beer events April 20 through 28. Take over the taps with beers brewed in Massachusetts. Your tap takeover could focus on one style, or your favorites. The only requirement for a Mass Beer Week tap takeover is that all of the beers featured in the event MUST be brewed in Massachusetts. Partner with one or more Massachusetts breweries and create a menu to showcase how the flavors in the beer pair with the food. You can go a step further and locally source the ingredients for your dishes and make it an ULTRA Mass. Produced Beer Dinner. Partner with local beer experts to talk about the past, present, and future of Massachusetts beer, invite a local beer author and host a book signing at your venue, or host a discussion about techniques to improve the beer enjoyment experience. If you are enjoying a locally made beer or visiting a brewery during Mass Beer Week share it, and tag it, with #MassBeerWeek. Be creative! Have fun! Celebrate Mass. produced beer! Be sure to post your event through BeerAdvocate to have it listed on the Mass Beer Week site. The only requirement is that your event must focus exclusively on beer brewed in the state of Massachusetts. For questions or more details contact on how to get involved, contact Katie Stinchon at katie@massbrewersguild.org. Haven’t had the chance to check out some of the state’s newest breweries? The Mass Brewers Guild has you covered. “Meet the Brewers: Freshman Class of 2018,” will bring together nine of the state’s newly launched breweries for an intimate, roundtable style tasting event with unique access to brewers. Tickets are $40 and all proceeds will benefit the Mass Brewers Guild, the state’s trade association that works to protect and promote the interests of craft brewers across the Commonwealth. To purchase tickets to Meet the Brewers: Freshman Class of 2018, visit mtbfc2018.eventbrite.com. On Saturday, Nov. 18 Thirteen local breweries will team up to help raise funds to support those impacted by the devastating wildfires in Sonoma County. Castle Island Brewing Co., Brick & Feather Brewery, Exhibit ‘A’ Brewing, Harpoon Brewery, Idle Hands Craft Ales, Mayflower Brewing Co., Moon Hill/Gardner Ale House, Night Shift Brewing, River Styx, Saltbox Kitchen Brewery, Sam Adams, Trillium Brewing and True North Ale Co., will donate a $1 for every pint sold in their taprooms to the King Ridge Foundation. The King Ridge Foundation, a Santa Rosa-based 501(c)3 non-profit, was founded in 2009 to raise money to support local youth development organizations. During times of heightened community need, its mission expands to focus on restoring normalcy in the community. Today, they have teamed up with our friends at Russian River Brewing Company, to serve as a nimble nonprofit entity to address the community's most pressing needs. One hundred percent of brewery donations made through the “Sonoma Pride” fundraising initiative will be used locally in Sonoma County. Tickets are $45 for General Admission and includes unlimited two-ounce beer samples from participating breweries. Non-drinkers that wish to enjoy the atmosphere and an afternoon with friends -- but are not sampling -- can purchase a Designated Driver ticket for $10. 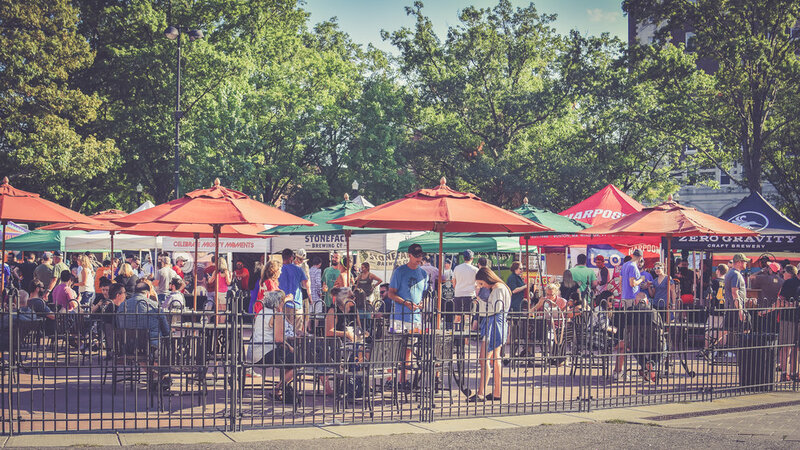 Once inside the festival, patrons can purchase gourmet eats served up by several food trucks onsite; Big T's BBQ, Press’n It, Sabor Latino, Teddy's Lunch Box, Travelin' Bones BBQ and Trolley Dogs. The full day of workshops will feature industry veterans and experts sharing their best practices and advice for newly launched breweries or breweries in-planning. Topics will include navigating the Three-tier System, shopping for real estate, employment law, taxes, securing trademarks and more. Space is limited. On Saturday, June 3, Sierra Beer Camp On Tour in Portland, ME, will host more than 3,000 craft beer lovers, 100 brewers, food trucks, live music and more. If you needed an excuse for a field trip this fest has got you covered. A portion of the proceeds from this event will benefit the Mass Brewers Guild. As our loyal fans, we'd like to offer you a special 10% discount - use code beer4MAguild at check out. This discount expires on Monday, May 29 so get your tickets today! The Rail Trail Flatbread Company and Massachusetts Brewers Guild (MBG) are teaming up on Monday, May 1 to host an all Massachusetts tap takeover and meet the brewer style event. From 5:30 to 9:30 p.m. head brewers and owners from Brick and Feather, Castle Island Brewing Co., Idle Hands, Jack’s Abby, Lamplighter Brewing Co., Medusa Brewing Co., Night Shift Brewing and Wormtown will be onsite to raise a pint, mingle, and breakout a special offering from each brewery every half hour. Mass Beer Week will take place from Saturday, April 29 to Saturday, May 6 and will focus exclusively on Massachusetts brewers, their beers, and supporting the beer community. This event is open to the public. Pay as you consume. The Rail Trail Flatbread Company is located at 33 Main St., Hudson, MA 01749. For more information about Mass Beer Week, visit MassBeerWeek.com. More than 60 Massachusetts brewers are coming together to launch the first ever, “Power Beer Fest,” on Saturday, April 29 at the SoWa Power Station. The two-session festival -- 1 to 4:30 p.m. and 6 to 9:30 p.m. -- will kick-off the season opening of the SoWa Open Market located at 540 Harrison Ave, Boston, MA 02118. Tickets can be purchased at powerbeerfest.eventbrite.com and are $55. Proceeds of each sale will benefit the Massachusetts Brewers Guild. Entry includes unlimited samples of beer. Patrons will have access to food trucks onsite. 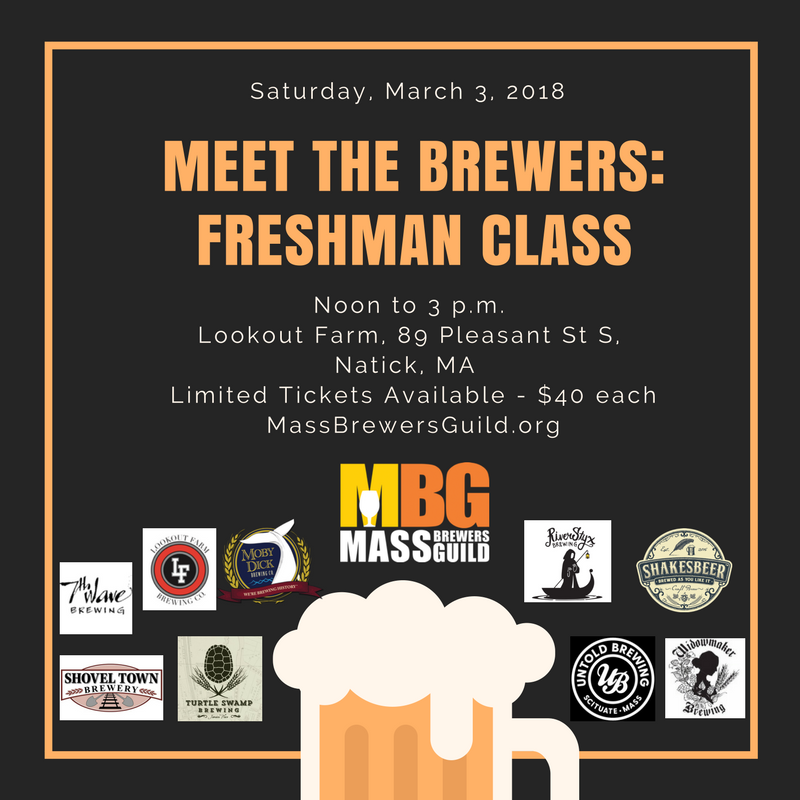 Seven of Massachusetts’ youngest breweries will be featured at the Mass Brewers Guild’s Meet the Brewers event, highlighting freshman brewers from across the state. The lineup includes new to the Mass beer scene breweries: Barrel House Z, Bone Up Brewing, Castle Island Brewing Company, Exhibit ‘A’ Brewing Company, Lamplighter Brewing Co., Start Line Brewing Co., and Stone Cow Brewery. Tickets will be limited to 70 people and guests will be broken up into groups of ten upon arrival. Each group will then have ten minutes with each brewer to enjoy a sample, ask questions and hear the story behind the beer before rotating to the next brewer. The roundtable style event aims to foster learning and education of the brewing process and inspire deeper connections between brewers and craft beer lovers.